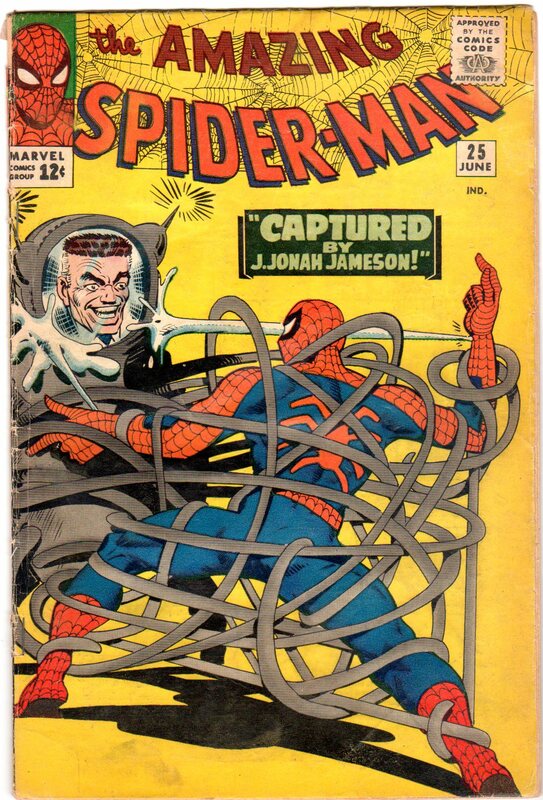 When I recently discussed how my odd obsession with Amazing Spider-Man #32 had some negative repercussions on my collection, I had ASM #25 in mind. While common logic would dictate that one comic book has absolutely nothing to do with the other, I understand that I would never come to own THIS exact copy of #25 if I wasn’t so fixated on the fact that a classmate of mine owned a copy of #32. For reasons that only make sense to me, and perhaps the most die-hard collectors who happened to get interested in an expensive hobby when they were young and didn’t have the cash-on-hand to back it up, I was undeniably anguished by the fact that nothing in my ASM collection was as “good” as that one kid’s issue #32. My ego led me to believe that he didn’t deserve to own such a key part of Spider-Man history and that I was the more worthy collector. This comic book collector injustice was just another reminder as to why life could be so unfair sometimes. And it’s with that irrational mindset that I made, perhaps, the first comic book purchase I would ever end up regretting. I was so obsessed with ASM #32 that the next big Silver Age purchase I was planning to make was going to have to be better it in some way. An easy way to accomplish that was to just find something that was a few issues older, that way, I could go into school the next day and in my big boy voice tell all those kids at school who didn’t get a crap that, “hey, he may own issue #32, but I own something ever OLDER than that.” For the record, I was not a very popular kid in junior high school, and it’s petty revenge fantasies like these that likely explained why that was the case. In truth, my collection was just fine. I had been attending comic book shows at a hotel near my home for a few months now and each time picking up some really great issues that would have made me the envy for any other 13-year-old collector. I was saving allowances and picking up back issues in the 300s, filling in those holes as I continued to grab the newest issue every month at my local comic book store, eagerly awaiting ASM #400 which was just around the corner. For every major holiday or rite of passage/milestone, I was begging my parents to either give me gift certificates to these stores, or ask the shopowners to sell them the best issues of ASM they carried (this tactic was only mildly successful). Looking back, there’s no question that my collection as a whole, was superior to this other kid’s, but I wasn’t satisfied knowing that. I had to best him on this #32 nonsense. So I made a classic mistake that any self-respecting collector will warn you about in a heartbeat – I made a purchase, not because it was the best deal, but because something was readily available and I could afford it. What I ended up getting was what an honest retailer would promote as a “reader’s copy” of ASM #25. While the scan provided probably doesn’t make it look QUITE so bad, the issue is very badly creased and wrinkled, re-stapled, and with sections of the back cover cut out and taped. On the grading scale, it’s probably the one honest-to-god “Fair” that I own, and while I haven’t batted an eye since then about hunting for decent look “low grade” copies for my collection, nothing I own is quite as beaten up and devalued as my copy of ASM #25. Before I go any further, let me clarify that I, in no way, felt ripped off during this transaction. I was hitting all of the tables at the comic book show in my usual fashion, and when I came across this one dealer, I mentioned that I was trying to find some pretty old issues of Amazing Spider-Man. While he didn’t have a lot of ASM, he did have this one copy of #25, which he admitted outright was “pretty badly beat up.” But the comic was also very appropriately priced. If memory serves, once the dealer saw me considering the purchase, he threw in a savvy line about this probably being my only chance to ever own such an old issue of ASM at such a low price. And he was right. I haven’t seen a copy of this issue for that cheap since. But I still regret the purchase. That’s a shame too, because I would love to have fonder memories about owning this particular issue. It’s a great cover by Steve Ditko. 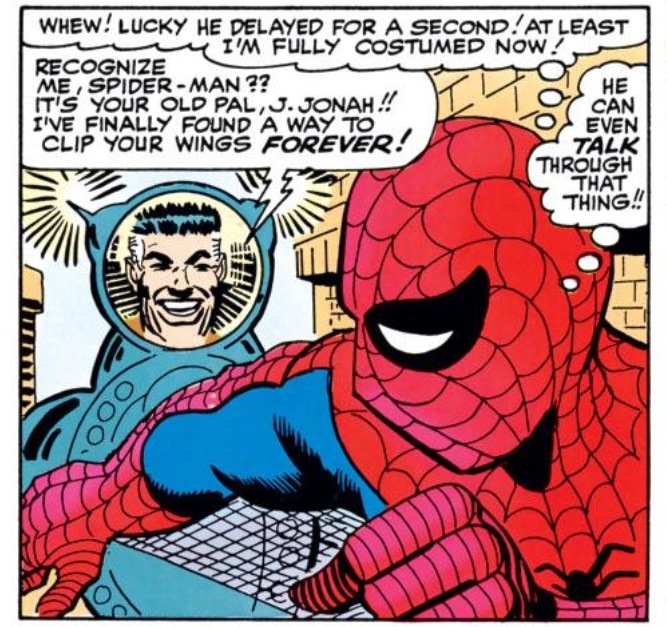 The mustardy yellow feels a little dated, but I love how up-close in the frame Spider-Man is – and is that newspaper editor J. Jonah Jameson in some kind of suit attacking Spidey? It’s the kind of cover that just screams “read me” and while I’ve always been this way and that about the whole Spider Slayer thing (just something about them fail to impress me), owning a better looking copy of this comic would ultimately bring me much more joy as a collector and a fan. But I also feel very conflicted about going back and buying another copy of an issue that I already own (and inevitably spend a decent amount of money on it), when there are still eight other issues of ASM out there for me to pick up in order to complete the run. With all that being said, once my initial chase has come to an end, ASM #25 will likely be the first issue I replace. While there are certain issues in my collection that are a little beat-up from age (and being owned by a 7-year-old version of myself), I’m less likely to get replacement copies because they are a nostalgic reminder of a time in my life when reading a copy of ASM was a brand new discovery for me. I’ve grown tremendously as a collector, and of course, as a person, that looking back at these issues like ASM #297 and ASM #321 and seeing some of their nicks and dings is not as offensive to me as looking at this #25 and thinking back to how an unhealthy obsession and overall pettiness drove me to make this purchase. 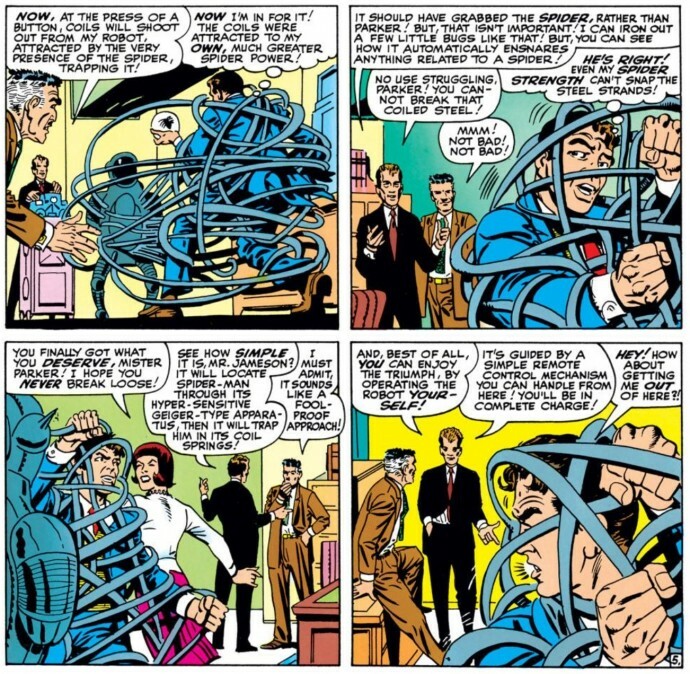 I guess the desire to replace comes from which version of myself I see in each specific comic – the passionate, Spider-Man fanatic who just wants to own every issue, or the more cynical “collector” who is more focused on having the “best” stuff that he loses sight of his priorities. All in all, one of my personal favorite issues of ASM, mainly because there is no new villain introduced, which means that the usual pages given over to that are dedicated to the supporting characters. 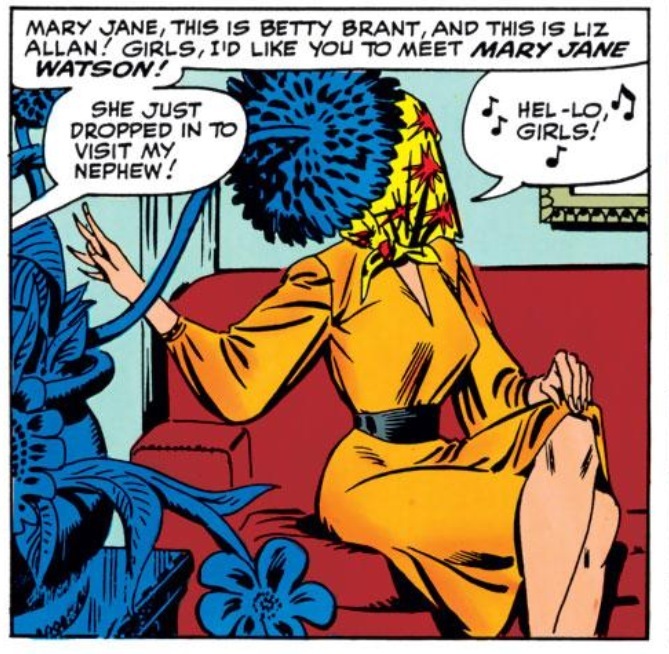 Lots more of Betty and Liz and Flash than usual, and the first glimpse of MJ. Great story! My version of it involves the Avengers #8, which (due to general destitution and that same feeling of “best shot at an early issue) even has holes from a three-hole punch! I can only imagine what other issues the original owner had forever marred in order to get his collection organized in binders. The three hole punch thing fascinates me. I’ve seen some people sell otherwise pristine copies of comics with the three hole punch and don’t get how they could be careful to care for their comic but punch holes in it!